After my day at the Vatican, I geared myself up to spend a day exploring the remains of the ancient Roman civilization. The plan for the day was to visit the Terme di Caracalla, Circo Massimo, The Foro Romano, Mons Palatinus and one of the most famous stadiums in the world The Colosseo. The Terme di Calacalla are a marvel of the ancient roman world. The gyms and spas of today can learn a thing or two from this wonderful ruin. Walking through the gardens are a calming experience especially because, this place doesn't draw too much of a crowd. 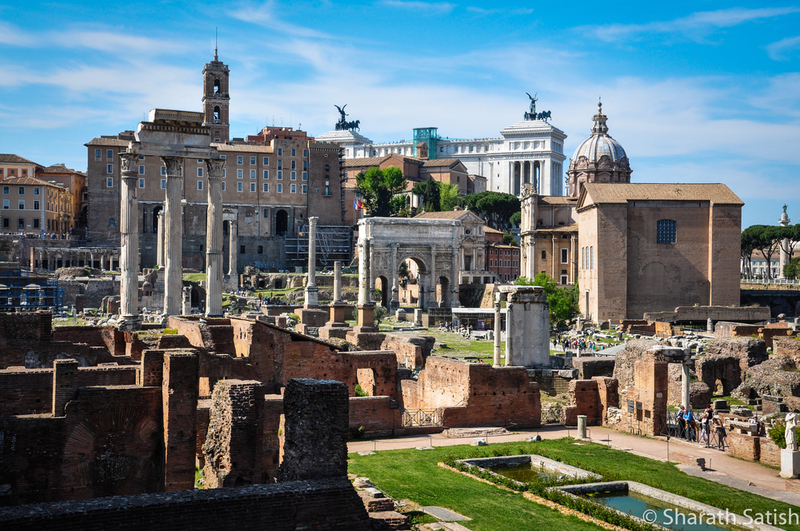 The walk upto this place from the nearest metro station takes you alongside a lot of other old wonders like the Circo Massimo, Mons Palatinus and San Gregorio Magno al Celio. From there I walked up to the entrance of The Foro Romano, a place where the people of Rome gathered for processions, trials and elections. It is surrounded by many other important buildings of ancient Rome. Today, it is a collection of columns and half buildings that have a small well tended garden right in the middle. This area is linked directly to Mons Palatinus and adjacent to the Collis Capitōlīnus. 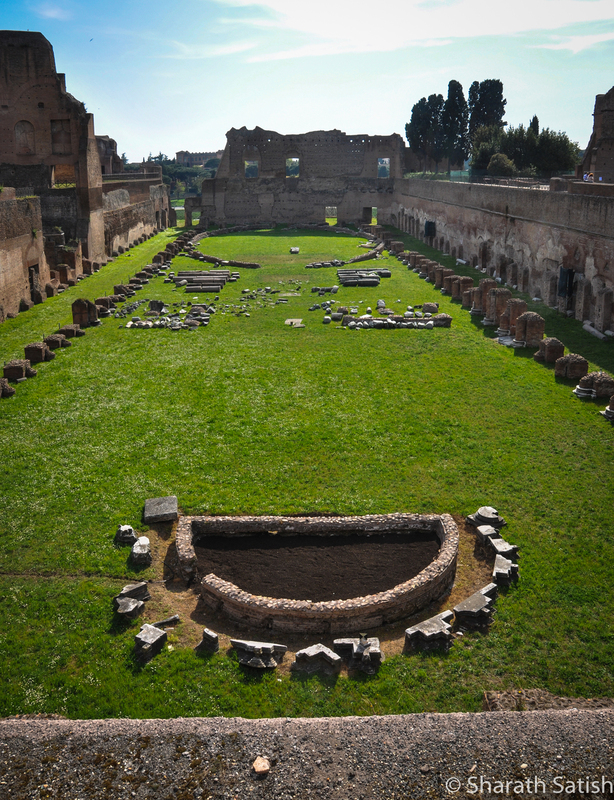 Palatine Hill offers a wonderful place to spend an afternoon exploring ruins and it also provides several places to get great panoramic views of Rome (Tip: If you want photographs of the city, don't go in the afternoon, evenings work best). A solitary tree at the top of the hill provided a nice break from the usual ruins and landscape, and right next to it was a stadium which was part of the Imperial Palace complex overlooking Circo Massimo. After Palatine Hill, I walked over to the Colosseo and walked around what remains a superbly preserved (and partly restored) stadium. It was quite crowded, but people are mostly quiet inside so its still an enjoyable experience walking around inside. Its a sobering thought that today's tourist attraction was the site for hundreds if not thousands of fights fought in that arena involving man and animal. However, its a testament to the construction skill of the ancient Romans (and the restoration skill of present day Romans) that the building is in the shape that it is today (close to 2000 years since it was built).